There’s just something about a good plate of Indian food. Since recently spending a few weeks in India, and now with my family in Canada – I miss Indian food! Haha I know I know… crazy how I can eat it everyday and still miss it! I enjoy how simple it is yet its pungent flavours and vivid colours to satisfy. One of my favorite Indian dishes is Aloo Gobi, which literally translates Potato and Cauliflower. However I made this one a little different than the “norm” – rather than using an ordinary potato I tried sweet potatoes. I also decided to add some tofu to the dish to make it a wholesome meal. The flavor is mild enough for anyone new to Indian dishes. 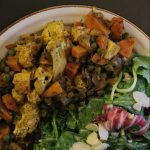 Aloo Gobi is one of my favorite Indian dishes made with potatoes (aloo) and cauliflower (gobi). Simple to make and its pungent flavours and vivid colours won't disappoint you! Heat heavy-bottomed large skillet pan over medium heat with coconut oil. Add the ginger, garlic, dry mustard, cumin and cloves and stir. Then add the onion and fry until fragrant. Fry this mixture until the onions are soft and just starting to turn brown, then add the chili, garam masala, turmeric, salt, maple syrup, water and potatoes. Cover and simmer over medium low heat for 10 minutes, add the tofu, cauliflower and cook until everything is tender, another 30-40 minutes. Add the lemon juice and peas at the very end. One of the best indian meal I had recently was in a tiny restaurant in Brunei when I visited my DH last December. I could dig in your dish, looks so good! Aloo gobi is the best! So easy to put together and yet so tasty. 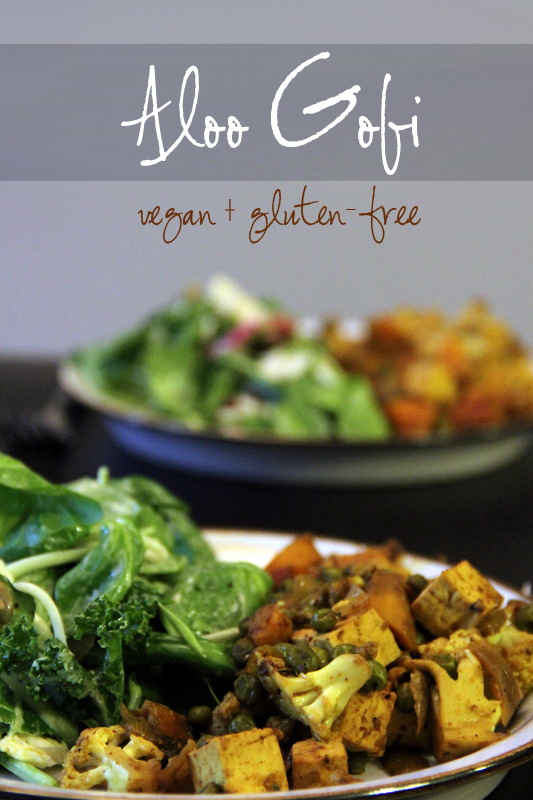 I like that you used sweet potatoes in this recipe – a nice change and so nutritious!